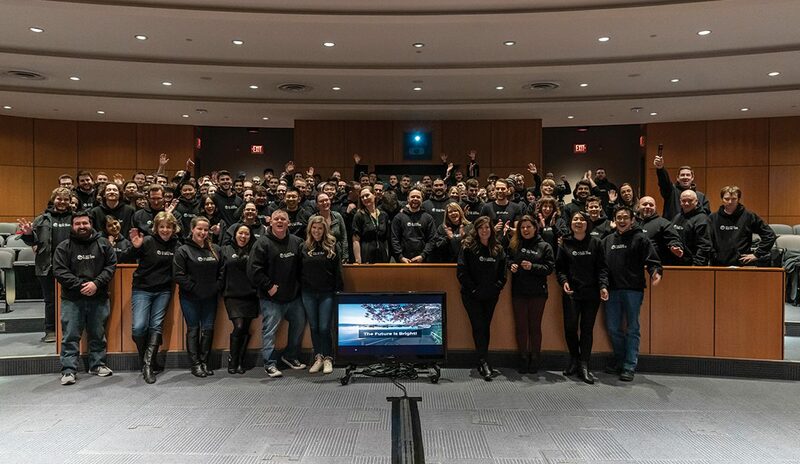 (Above) Morgan Carey and the Real Estate Webmasters team at their recent all-company Town Hall, February 2019. Real Estate Webmasters launched its first website in April 2004 and hasn’t looked back. Today, Real Estate Webmasters (REW) is one of the most successful technology companies ever in the industry. To mark their 15th anniversary, we sat down with CEO Morgan Carey to talk technology, buzzwords and what makes a rockstar client. Real Estate magazine: Take us back to 2004. Google’s Gmail is still in beta and Facebook is a private campus app. Real Estate Webmasters has just launched. Morgan Carey: Real Estate Webmasters started as a forum, a discussion board to help our real estate clients from our search engine optimization practice, SEO Guy. It quickly became the “go-to” for thousands of DIY agents and brokers. Before we knew it, we had grown to nearly 60,000 members. This is back before anyone in real estate had ever heard of ActiveRain or Facebook. RE: You mention your SEO clients. Who were some of the first, and how did you go from SEO to websites? MC: We started with Ed Kirkland in Destin, Fla. Soon after, we received a call from Gary Ashton in Nashville and then Mark Rasmussen from Sarasota, Fla., all of whom are still clients to this day, over 15 years later. They called us for SEO services, but when we evaluated the products they were working with, we realized that if we wanted to do a great job from an SEO perspective, we were going to need to redo their websites, as well. Back then, we dominated all aspects of SEO, and each of their sites quickly reached No. 1 in the search engines for hundreds of terms. People started to take notice, and soon we were growing our web design and real estate SEO practice at an exponential rate. RE: Client success is critical to your work. You’re on track to have 75,000 active paid users by year’s end. Who are some of your favorite clients to work with? MC: We’re honored to work with clients of varying types and sizes from across the Americas, but my heart is with the mad scientists, the innovators. Clients who are at the front of the innovation adoption curve. Those who want to be first and are willing to take a risk and try something new. And they aren’t just indie brokers or top agents. Mad scientists are everywhere, including large brokerages and enterprises. Our most recent project with Century 21 Canada, the largest custom project in history, emanated from a drive to build the best, most innovative platform in Canada. We’re now working on an even bigger venture in Europe that will once again be transformative, thanks to another group of amazing big thinkers. RE: Name three innovations Real Estate Webmasters brought to the industry over the past 15 years that you are most proud of. MC: The first big innovation was offering search engine spiderable IDX, which allowed so many more professionals to compete in long-tail search. Bringing responsive, mobile-friendly web design was an important move to allow professionals to connect with clients on-the-go. And now, we’ve built Virtual Reality and 360-degree photos/videos into our website products (an industry first) and Augmented Reality into our apps. Nobody else in the market has that. RE: Real estate has traditionally been slow to innovate, but the pace is picking up. Why do you think this is so important? MC: There are too many agents in the industry, and many who should not be. When we adopt new processes and technologies, it allows the true real estate professionals to provide higher-quality service to more clients, ensuring their interests and needs are protected. Once the true full-time professionals are able to take on more transactions, we’ll no longer need as many part-time/hobby agents. Fewer but higher-quality agents is better for the industry. RE: What trends do you think our industry could do without? MC: The rampant and utter misuse of high-technology concepts. Machine learning and AI are incredibly complex. Stop using them as buzzwords. Stop talking about technologies that are so far beyond the industry’s current ability to implement. Instead, focus on the fundamentals like automation, education and adoption. Ensure that your platform helps deliver on the basics like follow-up and accountability, and we will be much further ahead. RE: You focus on the top 1 percent. Anyone you want to shout out? MC: It’s awards season, so we’ve had some great updates recently in two of the largest organizations, CENTURY 21 Canada and RE/MAX. For C21, our clients included the No. 1 broker and the No. 1 team in Canada. At RE/MAX, we have 50 percent of the Top 10 teams including the No. 1 team in Canada, and the No. 1 RE/MAX team in the U.S. and worldwide. Both have been REW clients for over 10 years. Debra Beagle from Nashville was also awarded RE/MAX Broker of the Year. And these are just two organizations. You will find Top 10 clients at REW from all organizations. We are very fortunate to get to work with so many amazing entrepreneurs and brilliant business people. RE: Where is REW today, and what does the future look like? MC: We’ve been blessed to be one of the most successful technology companies ever in real estate. We’ve grown every year and have been profitable every year. We’re the only large professional firm in the industry to offer best-in-class platform, CRM and apps. We’ve fast become one of the top players in the enterprise space, as well. It’s our goal to be top three in this category. We’re built to last (not to sell out), and I think our track record of 15-plus years has shown that we understand and value our purpose. And that’s to help keep the exceptional brokers of this world relevant and at the center of the real estate transaction now and forever.